Mary Mary, Quite Contrary...what does your garden grow? 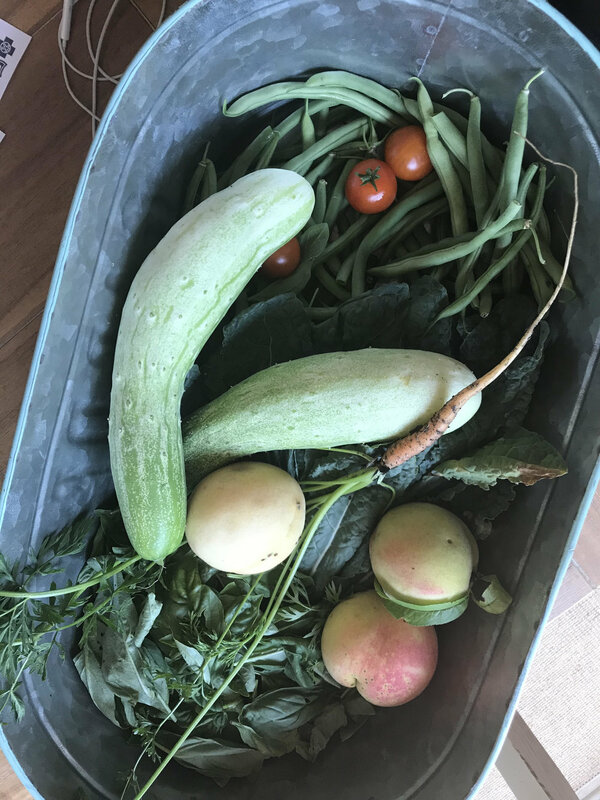 I'd love to say that as soon as we moved in we got our hands dirty and had an abundance of veggies to eat that first summer! In fact we didn't do any gardening until our second spring/summer as homeowners. And we had NO idea what we were doing. We knew to replace and replenish the soil but that was about it. We literally went to Lowe's one day, got so excited and overwhelmed that we bought TONS of seedlings not having any clue where/how/when to plant things. We tried: Broccoli, Cauliflower, peppers, tomatoes, lettuce, and cucumbers. We were actually able to harvest from most of our plants but we over-bought and over planted our broccoli and cauliflower, our cucumbers turned bitter after too long and some sort of bug attacked our pepper plant as well as two of our tomato plants. The next summer our beds became infested with fire ants so we decided to forgo the garden all together and ALMOST decided to remove the raised beds. I'm SO happy we didn't, guys because this year has been a completely different story! This is a shot from when our spinach and romaine was at it's peak! This year I was DETERMINED. I spent hours and hours researching different types of gardening, how to properly care for a garden and I learned about companion planting and am still learning about succession planting. I learned that certain flowers and herbs keep certain pests away and that starting your garden from seeds isn't as scary as it seems! I stayed up many nights while my family was in bed perfecting our plan. I even made these trusty templates when I finally got everything planned out. There are a few blank spaces to leave room for changes...and there were a few changes! Take a look at the templates I used: CLICK HERE! So as you can see I decided to use square foot gardening and relied heavily on companion planting. By the way, I got all of my information by starting on Pinterest! It was such a useful tool in finding and filtering out information! So far our planning has paid off and the garden has been VERY successful! I am currently harvesting about 2lbs of green beans per week, 2-3 cucumbers, kale, and we're starting to see some ripe red cherry tomatoes! Earlier this spring we had great success with our romaine and spinach. We buy greens every week so it was a lot of fun just walking out to the garden and picking my spinach for smoothies and romaine for salads! We are also growing watermelon and cantelope which were a couple of last minute additions. I am probably a few days to a week away from harvesting our first watermelon! 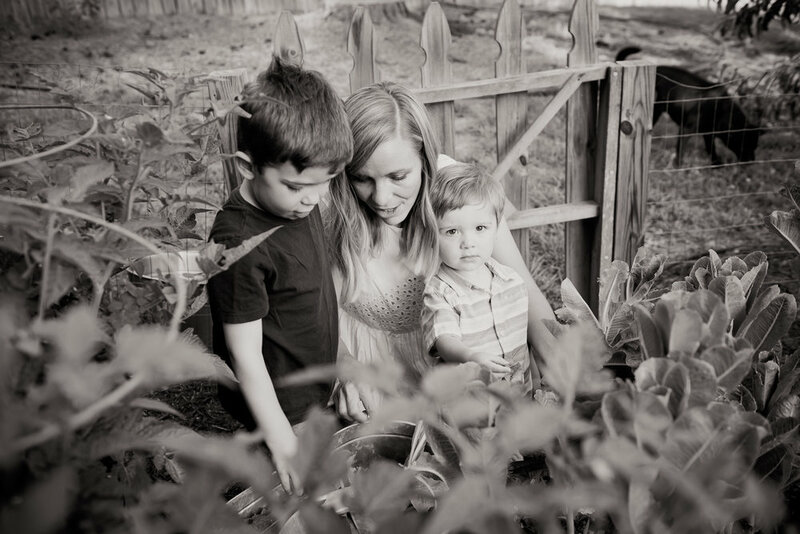 My boys love to help their mama in my garden! 1. Do your research. Especially if you are building raised beds, but also if you plan on planting right into your ground. Find out what zone you are in (we are zone 8 in NC) because this will impact what and when you can plant. Decide what "type" of gardening will be best for you (i.e. square foot vs. planting in rows). 2. Decide whether or not you are going to start with seeds and/or seedlings. If you are going to use seeds you may want to begin them in the winter inside so they are all ready to transplant after your last frost. Again, do your research here! 3. Map out your garden. I found this to be very helpful. I knew exactly what I wanted to plant, where I wanted to plant, how I was going to plant (seeds vs. seedlings), and when I needed to start. I took my templates to my local Lowes and nursery and instead of feeling overwhelmed I was prepared and new exactly what I needed. This also eliminated waste completely. That first year I'm telling you we wasted an embarrassing amount of seedlings. 4. Plant what you will eat! If you don't like eggplant now is probably not a good time to start eating eggplant! 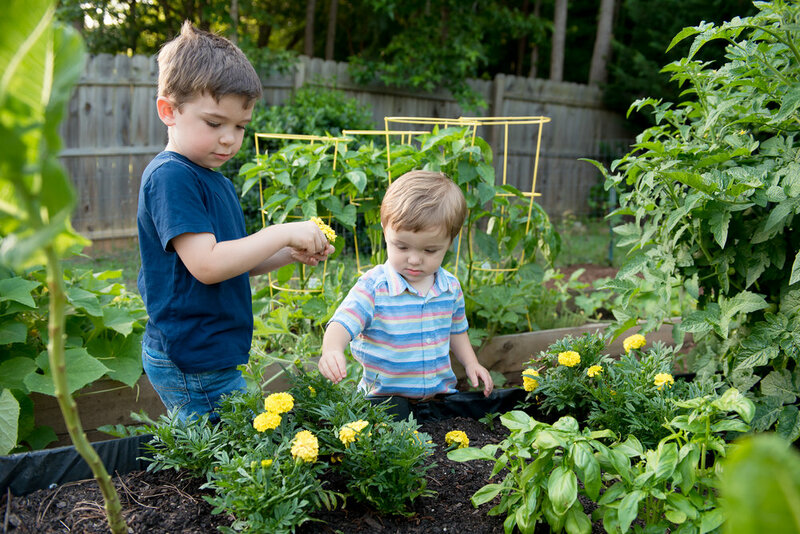 Starting your own garden can be quite an investment so spend the time and money on foods that you absolutely love and buy most often. This will save you so much money if you do it correctly. 5. Don't forget to take care of your garden. Weeding, mulching, trimming, watering, harvesting, etc. It all needs to be done and most of it needs to be done quite often! Don't make the investment just to let it go to waste. Certain veggies require more water (or less water!) than others so read seed packets, and again, RESEARCH! 6. Have fun with it! I have come to LOVE gardening and my favorite weekend activity is putting in my headphones and heading out to be with my plants. I know I sound like a crazy plant lady. But it is so fun to see all of your hard work pay off in the form of providing nourishment for you and your family. My oldest son gets so excited to see ripe tomatoes and asks "Did the tomatoes turn red yet?!" and he has become OBSESSED with checking on our watermelon. He runs out and yells "Look mama it growed!" It has been a lot of fun teaching him about how things grow and that not all of our food comes from the store wrapped in plastic. 7. Lastly, be patient and forgiving with yourself. I am learning so much but not every plant will be successful for one reason or another. For example, our carrots are about 50/50 right now because of the way I planted them with our green beans. they are not getting the sun exposure they need so I know that we will not get the harvest I was hoping for. I know better for next year, though! Do you garden? I'd love to hear about your favorite things to grow at home! While I didn't follow exact plans, I utilized a lot of blogs like THIS to get information about how many seeds/seedings to plant per square foot. 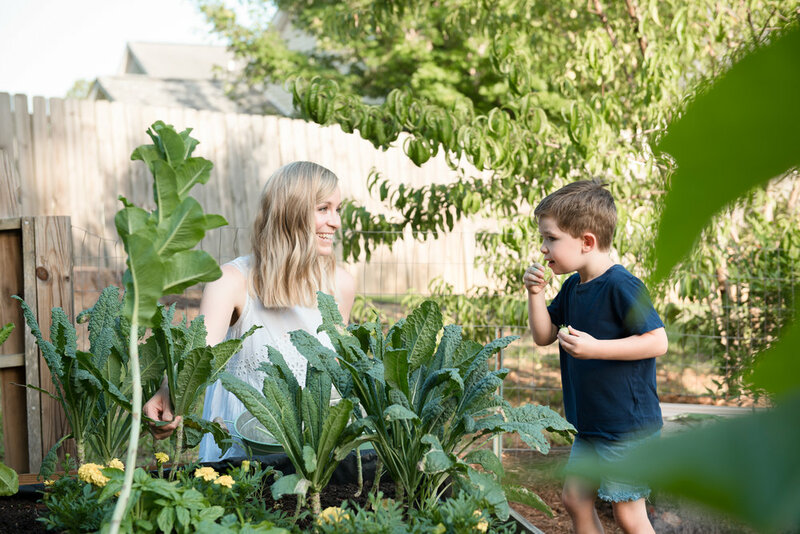 I love this easy, DIY plant fertilizer using banana peels! Want to start small and simple? Here is a quick guide on some fool-proof vegetables that are sure to provide generous yields!